Early Medieval coin: penny which has had the legend clipped off of either Eadgar (957-975) minted between 972 to 975, Edward the Martyr (975-978) minted between 975 to 978, or perhaps more likely Æthelred II (978-1016) minted in c. 977 or between c. 1009 to 1017. North Nos. 752, 763, 764 or 777. Obverse description: Diademed bust left. Obverse inscription: The legend has been clipped off. Reverse description: Small cross patteé. Reverse inscription: The legend has been clipped off. Silver penny of Edward the Martyr (975-978). 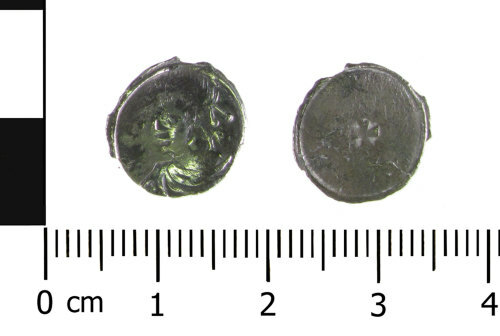 Minted in Stamford, moneyer was Hild. North no. 763 (pg 151 in North vol. 1).